This year marks the 150th anniversary of the first cattle drives from pastures near San Antonio, Texas, to the railhead in Abilene, Kansas. During a 20-year period starting in 1867, millions of longhorn steer that had multiplied on the Texas plains during the Civil War were moved up the Chisholm Trail for distribution across the country via the burgeoning railroad. As railways continued to expand, Wichita became an important cattle-shipping center along the Chisholm Trail. By 1872, the Wichita cattle pens were some of the busiest stockyards in the country. As one of our oldest neighborhoods, the Historic Delano District just west of the river in downtown Wichita was the center of Chisholm Trail activity. Today, Delano celebrates its Chisholm heritage with public art and is a family-friendly, walkable area featuring unique, independently owned shops, art galleries and restaurants. There’s a newly opened taproom, Aero Plains Brewing, that serves several beers influenced by the district’s cowtown days. The Historic Delano District is planning its major sesquicentennial celebration around the Delano Fall Fair, Oct. 6-8. 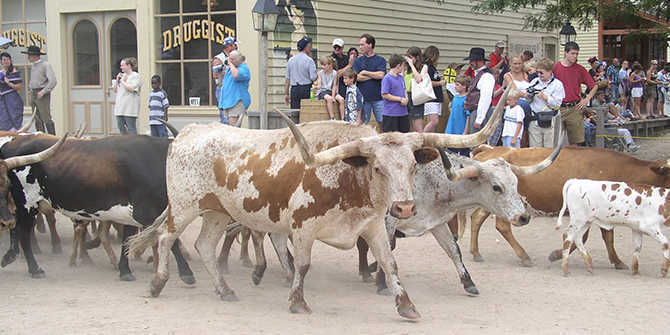 This family event will celebrate the Chisholm Trail with an array of events for all ages, from a re-enacted Running of the Doves by saloon girls, a Jesse Chisholm look-alike contest, campfire ghost stories, cowboy music, cattle drive, parade, chuck wagon cook-off and cowboy music and artisans. Between now and then, however, there will be events across Wichita to commemorate our city’s connection to the Chisholm Trail. You’ll find activities and special events at Botanica, Exploration Place, Great Plains Nature Center, Great Plains Transportation Museum, Mid-America All-Indian Center, Old Cowtown Museum, Wichita Art Museum, Wichita Public Library, Wichita-Sedgwick County Historical Museum and others. A cattle drive along the original Chisholm Trail sets out Sept. 12 from Pond Creek, Oklahoma, with stops overnight along the way and winding up Sept. 23 near Wichita. The public can visit the cow camps at designated times. Below is a listing of the Chisholm Trail events in Wichita over the next couple of months. The Wichita-Sedgwick County Historical Museum is hosting a free Kansas Day Celebration at 2 p.m. on Jan. 29 that will celebrate Kansas statehood and the 150th anniversary of the Chisholm Trail with musical performances by local favorites such as The Prairie Rose Wranglers, The Crowsons, The Home Rangers and others. Chisholm Trail: Laura Ingalls Wilder is a special author celebration from 6:30-7:30 p.m. Feb. 7 at the Wichita Public Library’s Westlink Branch Library, 8515 Bekemeyer. About 150 years ago, as the Chisholm Trail was first getting started, a young girl moved to the Kansas prairie. Laura Ingalls Wilder became a beloved children&apos;s author, best known for her “Little House” books about her childhood in the 1800s. In honor of Laura Ingalls Wilder&apos;s 150th birthday, Laura McLemore will perform as Laura Ingalls Wilder and present information about her life featuring artifacts representing items mentioned in her stories. This interactive event will entertain people of all ages, from kindergarten to senior citizens. The event is free. Wichita Public Library is celebrating the 150th anniversary with the Chisholm Trail Book Club at its Westlink Branch Library, 8515 Bekemeyer. This free, four-part scholar-led series of book discussions will focus on trail riding, the history of the Chisholm Trail and the work of a cowboy. The February selection is “The Last Cattle Drive” by Robert Day. It’s a rollicking tale of a modern-day cattle drive in Kansas that was loosely the inspiration for the film “City Slickers.” The Feb. 11 session is from 1-2 p.m. and will be led by Thomas Fox Averill, a Kansas author, Western literature scholar and English professor at Washburn University. Registration is required and begins Jan. 14; call 316-337-9456 or register online. There were very few trees on the grasslands of Kansas beyond the river banks. This mulberry tree served as a marker for Indian trails and later the drovers following the Chisholm Trail. It is estimated to be over 200 years old. For the past 120 years, the area around the tree has been the site of the Kansas Masonic Home. The home will host a Marking of the Historic Mulberry Tree and unveil a new plaque telling the history of the tree and the area. The free event will also include a lecture about Wichita’s history and the Chisholm Trail by Dr. Jay Price, tours of the building and refreshments. A traveling exhibit, “The Chisholm Trail: Driving the American West,” traces the trail from its 1860s beginnings to modern times. The exhibit makes a stop in Wichita at the Wichita-Sedgwick County Historical Museum from March 9-May 2. Created by Symphony in the Flint Hills and Flint Hills Design in Newton, the sesquicentennial original highlights the entrepreneurial story of the trail’s founding fathers, the drovers’ rugged life on the trail, the birth of the cowboy as an American icon, the famed “Old Chisholm Trail” song and movies, and includes several life-size metal longhorn cattle. The exhibit is included in regular museum admission. Wichita Public Library is celebrating the 150th anniversary with the Chisholm Trail Book Club at its Westlink Branch Library, 8515 Bekemeyer. The second in the free, four-part scholar-led series of book discussions is March 11 from 1-2 p.m. and will discuss “Cowboy&apos;s Lament: A Life on the Open Range” by Frank Maynard. The author is known for writing the classic ballad best known as "The Streets of Laredo" and hailed from Butler County, Kansas. This session will be facilitated by cowboy historian Jim Hoy. Registration is required and begins Feb. 11; call 316-337-9456 or register online. Celebrate the anniversary of the Chisholm Trail at Wichita Public Library’s Take Home Craft: Cowboy Hat event on March 18. Children ages 4-10 can pick up a packet of material to make a paper cowboy hat at home. Only simple tools such as scissors, glue or tape are required. Kits are available from 10 a.m.-6 p.m. or while supplies last at the Comotara Branch Library, 2244 N. Rock Rd (inside the Dillons grocery store). The event is free. Calling all cowpokes! The Cowpoke Festival at 10:30 a.m. on March 20 at the Wichita Public Library, 223 S. Main, is the chance for children ages 4 and up to learn about roping and riding, just like the cowboys did on the Chisholm Trail. Using “barrel” horses and soft ropes, participants will toss their lasso and try to hit the mark. Be sure to bring cameras to commemorate your time in the saddle, complete with hats and bandanas. Historian Joyce Thierer from Ride Into History will share information about horses and their gear, manure and much more about this important part of Kansas history. Thierer is also presenting another children’s program on March 20: Cattle Tails at 2:30 p.m. at the Alford Branch Library, 3447 S. Meridian. This one is for ages 8 and up and also celebrates Women’s History Month in addition to the Chisholm Trail. She will present the story of Texan Georgiana Jackson, who drove her family&apos;s cattle to Kansas during the War of Northern Aggression. Her family thought she would give it up after the war, but she went back to Kansas with her most loyal cowhands and started her own ranch. A Q&A will follow the performance. The events are free. Come to the Wichita Public Library’s Evergreen Branch Library, 2601 N. Arkansas, at 2:30 p.m. on March 21 for the free children&apos;s program Giddyup Ol’ Paint. Ages 8-11 can find out why cowboys have pointy-toed boots and what’s up with those funny letters on branding irons, then try their hand at roping. The Wichita Public Library’s Rockwell Branch Library, 5939 E. 9th St., is hosting the free children’s program Old West Storytime Plus at 2:30 p.m. on March 22. In addition to storytime, there will be activities including decorating a paper cowboy hat, trying your hand at roping a “steer,” and an indoor game of horseshoes. Registration required beginning March 8; call 316-688-9361 or register online. The Wichita Public Library has several Chisholm Trail-related events on March 23. Come to the Alford Branch Library, 3447 S. Meridian, at 10:30 a.m. on March 23 for the free children’s program Cowboy Music. Ages 2-8 will enjoy songs and books with a special guitar-playing cowboy. Ages 8-11 can find out why cowboys have pointy-toed boots and what’s up with those funny letters on branding irons, then try their hand at roping during the free children&apos;s program Giddyup Ol’ Paint at 2:30 p.m. on March 23 at the Angelou Northeast Branch Library, 3051 E. 21st St.
For ages 5-9, go to the main Wichita Public Library, 223 S. Main, for the free children&apos;s program Chisholm Trail Camp In at 2:30 p.m. Explore what life would have been like on this historic cattle drive, experiment with the different skills you would have needed to keep the drive moving, learn about their fine cuisine and sing songs around the campfire! Registration required beginning March 9; call 316-261-8512 or register online. The Wichita Public Library, 223 S. Main, is hosting a gathering of Kansas Regional History Writers at 2:30 p.m. on March 25. Authors who write about Kansas and its history will be on hand to talk about their books and how Kansas inspires them. Among the authors confirmed are: George Frazier, “The Last Wild Places;” Beccy Tanner, “Bear Grease, Builders and Bandits,” and journalist who frequently writes about the state’s history for The Wichita Eagle; and Jim Mason, “Wichita&apos;s Riverside Parks and Wichita: Postcard History.” The event is free. Sit back, relax and enjoy a ride in a comfortable bus while going back to the past to the days of the Chisholm Trail. The Chisholm Trail Bus Tour: Old Cowtown Museum to Caldwell will visit graves of people who walked the trail, stopping to see markers and memorials of where the trail used to be and enjoying visits to museums. Also included will be lunch by Sugar Sisters in Caldwell at the former Eastern Star/Masonic Hall and a visit to see longhorns on the trip back to Wichita. This is an all-day event starting and ending at Old Cowtown Museum. Continue to check the Visit Wichita Calendar of Events throughout the year for Chisholm Trail events in Wichita. For a list expanding beyond Wichita, visit the Kansas Coalition’s website at www.ct-150.com and the Oklahoma Coalition’s website at www.Chisholmtrail150.org.